Living… in the North Pole, of course! Visiting… New York City in 1945. 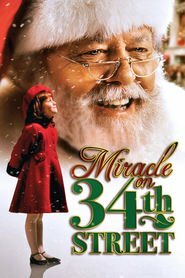 Kris shows up in town just in time for the Macy’s Thanksgiving Day Parade, where he notices that there’s something not quite right with the man they’ve hired to play Santa Claus on the float. Profession… spreader of Christmas cheer. While he’s in New York, Kris decides to take a position as the department store Santa Claus for the flagship Macy’s store on 34th street. Hired on by event director Doris Walker for his charisma and commitment to the character, Kris takes quickly to the work and draws large crowds. Interests… Christmas. It’s not just Kris’ job to be the caretaker of Christmas; it’s his immense pleasure. He spends his free time sharing the warm sentiments of the season, and checking in with people about what they’re hoping to find under the tree on Christmas day. Challenge… keeping the spirit alive. Kris is in town because he’s worried that people are getting caught up in the commercialism of the season. As he puts it: “Oh, Christmas isn't just a day, it's a frame of mind... and that's what's been changing.” His goal is to show people, particularly the cynical Doris and her daughter Susan, the true magic of Christmas. Personality… jolly, merry, and kind. Kris is everything that they sing about in Christmas songs and more. His laugh is infectious, bringing out the best in everyone. Kris is patient and persistent, able to endure countless adults telling him that Santa Claus isn’t real. At times, Kris gets downtrodden when encountering someone who starkly refutes the notion of Christmas cheer, but the jingle of a sleigh bell or the sight of a red bow is enough to refresh his spirits. His attempts to rejuvenate Christmas often compel him to be extraordinarily generous and honest, surprising people around him. It’s the best kind of surprise, one that leaves you with a warm feeling in your heart known as Christmas joy. Kris Kringle's popularity ranking on CharacTour is #3215 out of 5,000+ characters. See our top-ranked characters and read their profiles.